NEKTON-Baby-Bird is a complete formula for the successful hand-rearing of all bird chicks. This product utilizes the latest scientific findings in the rearing of young birds. NEKTON-Baby-Bird meets the needs of all essential nutrients such as carbohydrates, proteins, and minerals. Many of these nutrients are included in a highly receptive form, whereby their availability is significantly increased and facilitates digestion. High-quality natural products such as rose hips and pollen also provide numerous phytonutrients that promote healthy development of blood circulation, joints and organs. 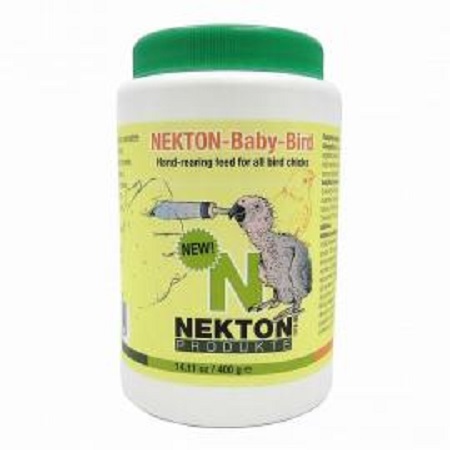 By using herbal components NEKTON-Baby-Bird is geared to the natural diet of birds. In addition, herbal ingredients have a strengthening effect on the immune system of young birds. The high-quality vegetable oils in NEKTON-Baby-Bird deliver all the vital unsaturated fatty acids..
NEKTON-Baby-Bird contains probiotic bacteria that promote healthy development of the craw and intestinal flora of bird chicks. Prebiotic components in NEKTON-Baby-Bird also have a positive effect on the composition of the intestinal flora, whereby an optimal digestion of nutrients is ensured. To avoid contamination with harmful bacteria, the water can be boiled in advance or use water from bottle. Storage: NEKTON-Baby-Bird should be stored dry and out of sunlight, between 15° and 25°C. Incredients:Dextrose, vegetable protein extracts, bakery products, minerals, yeast, derivatives of vegetable origin, vegetable oils, rose hips, pollen, yeast cell walls (containing mannan-oligosaccharides with prebiotic effects).